2019 marks the 11th year since YouTube’s entry into the Indian market. To help marketers and creators understand the massive impact YouTube has made in India and its importance in the digital ecosystem today, Youtube hosted the 2019 Brandcast in India. YouTube currently has over 265M users in the country and this number is expected to reach 500M by 2020. This incredible number is in relation to the increase in the total number of internet users in India that has grown from 15M just five years ago to 100s of millions of users today. Its ability to provide a personalised media experience and offer content in various languages has made YouTube one of India’s most-used platforms. Over the last 11 years, YouTube has become a platform for storytellers and creators to share content in different languages and reach an engaged audience in rural areas and big cities alike. It has become a success story for numerous YouTubers like ‘Mostly Sane’ who uses YouTube to discuss social issues such as mental health (the channel is currently at 3M subscribers) and more recently Priyanka Chopra, who chose YouTube to extend her audience reach with hew new show ‘If I could do just one thing’. Susan Wojcicki, CEO of YouTube, says it is the preferred social platform for creators and businesses alike due to its ability to reach out to a large audience pool in a personalised way. When Pepsi ran an ad campaign on YouTube, it saw a 14% increase in sales and 3.3x return in ad spend. Alternatively, Hyundai’s ad campaign had a massive audience reach of 221M. The ability to scale and impact on YouTube can result in business leading results. Currently, vernacular content is taking centre stage and has helped increase engagement across all channels. How is the media landscape evolving? Mark Patterson of Group M discussed the video revolution in India and how it has changed the way brands communicate with their customers. Group M is a media advertising company that has had a presence in Asia for more than 2 decades and is responsible for 1 in 2 ads in India. Mark highlighted the evolution of the media landscape and how mobile video has become a secret weapon for many marketers. One of the main reasons for this is the change in the way users consume content and seek entertainment. They look for three things: convenience, customisation and choice. Statistics show that 60-70% of people in India consume content on mobile video every day. The digital spends in India remain comparatively low when compared to China where 64% of ad spends is digital while this is only at 18% in India. However, India is one of the fastest growing economies in the world at a 14% GDP and digital ad spends is expected to catch up soon. Mark Patterson also discussed the three main themes on the why and how of digital advertising in India and how YouTube affects these themes. YouTube has allowed marketers to have a mass reach and gain more awareness of their brand with tools such as YouTube Masthead. YouTube allows for personalised messaging that has helped deliver performance. This has resulted in a 20% uplift inconsideration, a 31% increase in awareness and a 900% increase in search queries. While this is still a fairly new concept for most media agencies. Group M has taken a step in this direction by integrating YouTube reach data with Group M planning tools. This has helped them optimise maximum reach across multiple devices. It is no secret that Youtube has become the secret weapon for many marketers to reach their target audience. To take advantage of the immense reach that Youtube offers, Social Beat collaborated with our client Sundaram Mutual to create a masthead ad to promote their new fund. This campaign generated incredible results, proving the effectiveness of Youtube as a medium to reach out to the target market. Sundaram was launching an open-ended equity scheme and wanted to create awareness around their product within a short period of time. Digital marketing has been proven to provide finance companies with the reach they require so Youtube was the obvious choice when it came to achieving the objective. How was the campaign executed? Mastheads are usually charged on a daily basis so we used the 24 hour period we had as effectively as we could. To enable maximum viewership we ran the campaign over the weekend. For the entirety of the day any individual that accessed Youtube through their desktop, tablet or mobile device saw the masthead ad at the top of their pages. This helped us increase our subscriber base and drive traffic to the website. The 20-second Sundaram masthead achieved phenomenal results. Sundaram’s subscriber base grew from 356 to an outstanding 56,000! It has increased since then and is currently standing at 57,000 and growing every day. The video also generated 14 million views in a span of 24 hours. To achieve these incredible results, we adopted a digital-first marketing strategy to reach the target audience. We were also able to track and measure our results to scale the brand to new heights. You can read more about our Youtube ad campaign with Sundaram Mutual here. Many people assume that with all the content out there, the consumer’s attention span is decreasing but this is not true because people today prefer long-form content to short-form content. What has changed is how quickly consumers reject and accept the content they consume. The content needs to be longer, richer, deeper and grab the attention of the viewer faster. Another way a brand can improve ROI is by understanding the customers better with more personalised messaging. They should change content according to the target audience and in a way that will allow the brand to relate to the customer better. Statistics show that customisation of the ads specific to the target market can result in a 10% lift in ad recall. Research has shown that In India 60-70% of content is consumed via the mobile device. Therefore, when creating content, brands need to keep in mind that the shots framed and the stories told are optimised for the mobile user. It is important for agencies to rethink their digital content strategies this way so they are able to get the brand message to the target audience better. To help agencies adopt the above strategies in their content plan, a new Rethink Council has been created to identify how brands can rethink their marketing and targeting to measure and maximise creativity to connect to the customer. YouTube Brandcast India 2019 ended with an insightful discussion with world-renowned director Zoya Akhtar. She highlighted the importance of the role YouTube played in her recent film ‘Gully Boy’ and how she was able to discover and do in-depth research for the movie through YouTube. YouTube also played a huge role in promoting the supporting content for the movie such as trailers and interviews. YouTube has played a crucial role in the evolution of digital media in India and YouTube Brandcast 2019 highlighted the importance of the digital platform and how it has changed the way people consume content in India. Road safety has become more important over the years as the number of cars on the road has continued to increase. Traffic safety is essential as it helps prevent drivers of vehicles from causing accidents and hitting pedestrians. Laws are enforced to ensure the safe and efficient flow of traffic. Social Beat recently did a video on road safety titled ‘A Day in the Office ft. Bad Drivers’. The objective of the video was to mirror the bad behaviour of drivers on the road in our everyday office life. It took a hilarious stance on road safety and covered rules such as ‘Don’t text while driving’ and ‘Don’t drive on pavements’ with the use of common office etiquette as examples. The video aimed to communicate the message that the rules you follow at the workplace should be followed on the road as well. The video was promoted on Facebook and Instagram and had a total reach of 26,264. It helped broaden our presence and increase engagement on social media and increase the number of subscribers and followers on different social media platforms. The video also demonstrated our expertise across different video types. As a part of our Second Digital Leadership Summit at Mumbai, a panel discussion was held on the future trends of digital marketing - AI, augmented reality and vernacular content. The two panellists were Ms Channan Sawhney - Head, Digital Marketing, Johnson & Johnson and Mr. Prathyush Kukreja – Head, Product Monetisation at Haptik. The session was moderated by Mr. David Appasamy, Head of Brand & Strategy, Social Beat. Artificial Intelligence and Augmented Reality has a huge role in driving sales and ROI. Brands must adopt artificial intelligence to deliver the right brand messages to the audience. It’s high time for FMCG companies to adopt AI technology to break the clutter in the industry. The future of digital marketing lies in localised content. Brands must utilise the power of voice search and multilingual marketing to build an effective conversational AI. Marketing automation has become much easier with the advent of AI and AR. achieving the necessary business objectives. According to Prathyush, this is an era of Conversational AI, a subset of Artificial Intelligence backed with data collected by brands and advertisers. Brands must build conversational AI to communicate with the users based on their behavioural and transactional or historical behaviour. Unlike a television commercial or a radio advertisement, conversational AI is not linear and one-to-one. When you use conversational AI in advertising and branding, each and every customer is unique and the content will be customised according to the needs of that particular user. He further added that Artificial Intelligence considers several other factors such as the buying nature and purchase frequency of the user. This where AI is today. AI is no longer a buzz word today, but, it is a tool of competitive advantage. Currently, brands are competing with each other to develop better AI to deliver better ROI in terms of acquiring users and telling better brand stories. Channan from Johnson & Johnson said that AI technology is not utilised to its fullest in FMCG industry. If used properly, AI has the power to break the clutter and make the brand stand out. Brands can convey right messages to the user in such a way so as to create a long lasting impact on the audience. Johnson & Johnson is employing AI technology rather than AR. Google and Facebook have already started their AI and AR journey. Other brands have huge benefits from this. But, for FMCG companies, implementation of AI technology is extremely important since this is an industry that communicates with its audience on a day-to-day basis. According to Channan, consumers are always on a look out for good content on the Internet. In the case of Johnson & Johnson, there is a huge demand for content related to pregnancy and newborn care. It is observed that most of the customers prefer consuming the content in their own local languages. If you are a market leader in a particular industry, it is important to take the lead and provide the kind of content that the consumer is looking for. That’s why Johnson & Johnson has adopted an active native content strategy. One of the biggest priorities for Johnson & Johnson is to strengthen their regional content strategy so as to deliver the right brand messages for the audience in a manner that they want to hear. Prathyush highlighted the importance of integrating voice search and vernacular content to build the effectiveness of conversational AI. Nowdays, majority of people are accessing the Internet using vernacular languages rather than English. The Internet has witnessed a commendable shift with the introduction of voice search. This technology is much user-friendly in the sense that users can directly talk to the device without even touching it. Hence the power of voice search is immense. According to data from Google, after the introduction of voice search, Hindi is the most preferred language for content consumption. Taking this into consideration, Haptik is also working on developing a conversational AI with vernacular capabilities. Many of the leading advertisers are also leveraging Devanagari scripts and other local languages in their lead generation and branding campaigns on various digital platforms. How are brands benefitting from investing in AI technology? Prathyush spoke about an interesting campaign that Haptik had conceptualised for the Bollywood movie Thugs of Hindostan. Google Maps was a great digital marketing tool for this movie. When somebody asked for directions, instead of the usual voice, users could hear directions from Aamir Khan himself. These innovations by Google and Facebook can be adopted by companies specialised in AI technology in order to help brands and advertisers offer value to their customers. content that is fun and quirky. Can Augmented Reality become a reality in 2019? story telling tool for brands if it is used for delivering the right message. for AR to establish itself in the digital landscape. marketing that help in delivering right brand messages for the right target audience. This was indeed an insightful panel discussion and brand strategists from across sectors understood the need for adopting such advanced technologies like artificial intelligence and augmented reality to drive sales, generate leads and withstand competition. The recently concluded second edition of our Digital Leadership Summit held in Mumbai saw many industry leaders sharing key insights and discussing trends in the digital marketing landscape. Among our speakers was Mr Abraham Alapatt – President and Group Head: Marketing, Service Quality, Value Added Services and Innovation at Thomas Cook. Mr Alapatt spoke about unlocking growth through innovation. Let’s take a look at some key insights from his speech. Alapatt spoke about his role as head of innovation at Thomas Cook. Innovation isn’t something that is forced. Innovating your process or brand for the sake of innovation is redundant and will only do your company more harm than good. As a brand, try to look for a particular value to enhance. The easiest way for businesses to innovate is to find new customers or create a unique opportunity with an existing customer. The best way to this is by implementing a full-funnel marketing approach will help target and retain customers better. Take a look at our video on full-funnel marketing and how it can help your brand. Many brands are still yet to make the shift from traditional marketing to digital. Today, ignoring the power of digital marketing means leaving your brand in the dust. By employing a digital-first strategy, any brand can achieve higher reach, better engagement and an increase in generating high-quality leads. Here, Alapatt cited two examples. The first was targeting people who make pilgrimage visits. The Thomas Cook website lets users create personalised tours and packages centred around pilgrim centres around the country, pre-book the darshan and continue on the holiday. This feature helped them tap into a whole new target audience including those in tier I and tier II cities. The second was adding an “Explore” feature to target millennials. The explore button gave millennials the chance to create their own personalised list of activities including adventure sports, sightseeing, etc. as well as a prompt to download an app that shows your every route needed for your vacation. The idea behind these features on Thomas Cook’s website was essential to explore new categories to tap into India’s next billion internet users. Alapatt touched briefly upon Thomas Cook’s virtual reality feature that gives customers a sense of their planned vacation. In the last few years, virtual reality has become a significant part of mainstream digital marketing efforts. Google India’s Year in Search Report 2017 posits that the Indian travel market will hit $48 billion by 2020. Given these substantial numbers, VR is an excellent way for a brand’s audience to “experience” their products or services without direct physical effects. Not only does this help increase engagement, but combined with an effective digital marketing strategy, VR can help mould the future of marketing for your brand. YouTube is currently the world’s second most popular search engine. In India alone, there are now around 225 million active users on YouTube, with this number expected to increase to 500 million by 2020. Brands need to leverage the power of YouTube or face losing out on a sizeable audience. From ensuring your video content uses techniques like YouTube SEO to exploring multiple formats, brands can improve performance and conversions. Videos have been around for decades, but have recently found their spotlight in terms of social media and digital marketing. Going forward, videos and interactive content will be at the forefront of digital marketing trends in 2019 and beyond. Innovation does not need to be restricted to marketing efforts or revenue made. Several brands around the world focus on giving back to their community and society at large. Thomas Cook, too, with the aim of social impact started a Centre of Learning. The primary objective of this institution was to drive skilling and employability. They are also involved with multiple NGOs and government organisations that help uplift those in need. CSR via innovation is another way to scale up your business in 2019.
and act with the future in mind while continuing to deliver results. One of the key highlights of the Digital Leadership Summit held in Mumbai was the panel discussion on the topic ‘Building a brand through digital marketing – Pushing the Frontiers’. The discussion moderated by Mr Suneil Chawla, the Co-Founder of Social Beat, had two reputed panellists: Mr Ajith Narasimhan from Sundaram Mutual Fund and Mr Vipin Guliani from Piramal Group. Let’s take a look at the key insights of the session. In order to build and sustain a brand, you must strategise your digital marketing techniques. Digital Marketing is no longer just a marketing tool. The customers of this generation need to be acquired, nurtured, retained and engaged with. Today, customers are more interested in curated, solution-based products and goal-based offers. Everyone has been talking a lot about the increasing impact of digital marketing in building a brand. But the most important factor that needs to be discussed is the nature of the digital marketing technique, which in fact, plays a major role in achieving the desired results. That very thought started off the panel discussion. So how strategic or technical is digital marketing today? Ajith from Sundaram Mutual Fund strongly believed in the strategic nature of digital marketing techniques. To substantiate his stand, he explained how the shift of mutual funds from being a push-driven product to a pull-driven product, paved the way towards the necessity of digital marketing today. Due to major changes brought in by GST and demonetisation, mutual fund companies no longer need a medium of distributors to sell their products. Customers from the newer generation are more interested in getting serviced by the companies directly. Therefore, it becomes very important for companies to build a connection with the customers as well as retain that connect for a very long period of time. This is why the industry gives a highly strategic approach to digital marketing. Doing that helps them understand the need of the customers and provide them with services as per their requirements. Vipin, from Piramal Group, too emphasised on the strategic nature of digital marketing today. When the aim is to build and sustain the brand, it becomes important to strategise digital marketing. However, he gave equal importance to the technical aspect of digital marketing as well. He was of the opinion that only the technical data mattered as far as the sale of the service or product was concerned. Both the panellists were of the same view that digital marketing has evolved to a great extent and is no longer just a marketing tool. Over the years, the type of customers who consume different products and services have changed to a great extent. The customers of this generation need to be acquired, nurtured, retained and engaged with. The need to innovate new ideas in order to connect with and understand these customers is the need of the hour. Apart from giving companies the advantage of targeting the right customers, digital marketing also helps them to understand the needs of the customers and design their brands and services accordingly. Therefore, it becomes important to incorporate digital marketing techniques right when the idea of launching a product or a service comes into the picture. With changing times, the kind of products and services that customers need are also changing. Ajith was of the opinion that in the coming years, there will be a need to re-categorise the products completely. The need of the hour then would be curated solution-based products and goal based offers. That is when there will be a great scope for bringing in innovation in the digital space and engaging with India's next billion internet users. Vipin also agreed with him. The requirement now is to first find out what the customers need and then build the product. This involves a lot of research for which innovative ideas have to be developed to find the right information from the customers through the digital space. The number of consumers has increased rapidly. And not all the people who consume data are recurring customers. There is a need for customer profiling in order to put forth the right suggestions to the customers. Both the panellists agreed that the digital strategy that needed to be applied here varied in the case of B2C and B2B. Since there has been a shift from mass targeting to micro-targeting, strategies, too, need to be changed. Instead of bombarding all the people with the same digital ads and search ads, it is important to connect with people based on their profiles. This data-driven model would do wonders in the area of lead generation. In the case of B2B, the target audience is very limited. Therefore, a blended strategy could be used, wherein apart from directly trying to convince the distributors, the help of customers could be taken to influence the decision of the distributors. This could be done with the help of social media platforms like LinkedIn. Is digital marketing worth the money? The new generation needs easy access to everything. Today, it is not difficult to bring a customer on board if your products are given to them in the most simplified manner. Going the digital way makes sure that customers get instant satisfaction. Therefore, it is necessary to spend the money to upgrade the reach of the company. As compared to the other mediums, digital marketing is the most objective way of measuring ROI. It becomes easy to determine the success or failure of one’s campaign if it’s ROI driven. Not only does it help to determine the number of engagements, but it also helps in finding out the right platforms that help in targeting a specific audience. With ROI driven marketing technique, brands can easily recognise the right social media platform to connect with their customers. Both our panellists were of the opinion that digital marketing is a key player as far as the game of connecting with the customers or distributors is concerned. The Womenwill Leadership Workshop was an initiative conducted by Google. The world’s most used search engine had invited its premium partners to nominate the inspiring female leaders of their organisations. Rachna Ganatra – Head of Strategy and Business Development – represented Social Beat in the workshop. The event was geared towards understanding gender disparity issues that women face at work. It also threw light on how to overcome systematic and personal barriers in career success, building confidence, recognising and creating strong connections and making a robust personal plan to move ahead. The workshop was conducted by the very accomplished and vibrant team of woman entrepreneurs Jinny Riat and Neha Kalia who used a lot of storytelling and kept the audience engaged throughout the workshop. It was amazing how participants opened up about challenges, personal experiences and collectively worked on exercises that were geared towards a lot of self-reflection and taking ownership to drive solutions. Women in digital agencies make up 53% of entry-level employees but only 19% become C-Level executives. 7% of leadership positions within Google Premier Partners are held by Women. Campaign Diversity Research shows that only 9% of leadership positions within the industry are held by women, while 89% of women are motivated to lead. Tips to get rid of self-doubt that most women suffer from: It was an eye-opener to learn from Google that women are the worst critics of themselves. As per recent Google statistics, a woman applies for a job when she has a requirement level of 90%, but a man applies when the level is just 60%. Also, women are bad negotiators when it comes to salary. Accepting your achievements and owning them is clearly important and women should train themselves to understand that they deserve it all. The “I AM REMARKABLE” session, conducted by Sujatha Kumar, was specially designed to get participants to recognise their key qualities and why they were remarkable both at work and personal life. The day-long workshop was a wonderful opportunity for self-learning and reflection. Additionally, the attendees shared space with other exceptional women in the industry, with a lot of bonding over wonderful personal experiences. Since Social Beat is an organisation which has more than 65% women in its workforce, the insights were really helpful and inspirational. However, it was not all about learning. The venue, decor, goodies and food were all tastefully done with a thematic layout across. Not only was the workshop extremely enriching and enlightening, but it also had a vibrant ambience, accounting for a day of laughter and bonding. As the saying goes – A woman is unstoppable when she realises she deserves better. Social Beat is happy and proud to be part of this initiative. You can also read our blog on women in leadership and how to retain talent in a start-up for more insights. Are you looking out for some really interesting, inspirational and power packed events? Attend some of the biggest marketing and digital marketing events in Mumbai, Delhi, Bangalore and other parts of India; that not just inspire but also give you an opportunity to network with the best marketers in the country. It’s an opportunity to listen to the finest in the advertising and marketing field – a forum that stimulates conversations and ideas around design, marketing, digital and more. You may also find it useful to read our book on digital marketing and view the Digital Bytes knowledge series on the Social Beat YouTube Channel. Here’s a quick glance into our compilation of top marketing events taking place across the country in 2019. Exchange4media organizes the Indian Digital Media Awards since 2010. It has always encouraged contributors in the 360-degree digital media space to keep getting better with the transformations taking place in the industry year on year. For this, it recognizes their talents, appreciates and celebrates them through these awards. It has showcased the work of many contemporary digital professionals and rewarded them for their beautifully executed digital blogs and viral campaigns. This event in itself is a huge networking opportunity for every business professional to connect and grow. Campaign India is back with the ninth edition of its awards on 5th Jun 2019 to honour excellence in digital advertising and marketing. Rechristened Campaign India Digital Crest Awards (CIDCA) in 2013, the property has evolved over the last nine years from its origins (as the Campaign India Digital Media Awards), to remain contemporary, relevant and inclusive of the dynamic changes in the digital ecosystem. It also features an award evening. Placing greater emphasis on ROI and effectiveness, significant changes were introduced in the jury composition in 2018. Exchange4Media group boasts of another event that it hosts, the Pitch CMO Summit. It is considered to be their flagship event which gathers some of the greatest marketing minds to discuss the latest, complex and challenging marketing trends in the global market scenario. Every year, the event is theme-based. The theme for 2019 was “Reinventing Consumer Experience”. At the Pitch CMO summit on 7th March 2019, leaders from the Industry explained how to concentrate on ‘the buy’, underlines the challenges, and highlight the opportunities. ad:tech is the original industry authority for marketing and media technology, where marketing, technology and media communities assemble to share new ways of thinking, build strong partnerships, and define new strategies to compete in an ever-changing marketplace. The 10th edition of ad:tech in Mumbai will take place on 13th and 14th November 2019. The summit will enable participants to explore the future of marketing and discuss the ever-evolving and complex landscape, focussing on how technology, data and content are helping brands win through superior Customer Experiences, regardless of the touchpoint. Social Beat, a digital marketing firm present in 3 cities, Chennai, Bangalore and Mumbai conducts free events across these 3 cities. 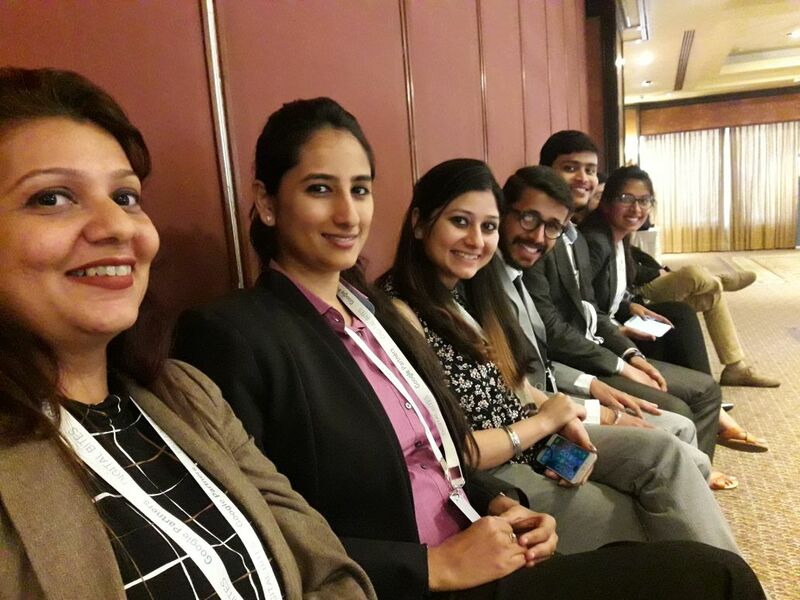 Digital Leadership Summit in Mumbai, Bengaluru & Chennai - This is a CXO event which brings together Business Leaders and CMOs to discuss how to drive business results through digital marketing and share innovation across Video, Vernacular Content, Voice, Artificial Intelligence and Virtual Reality. The business leaders and attendees would be from across sectors, including FMCG, BFSI, Real Estate, Entertainment, Education and Internet Businesses. The most recent Digital Leadership Summit was in Bengaluru on 26th Feb 2019. The one prior to this was on 15th Nov 2018 in Mumbai. The first edition of the Digital Leadership Summit was held in Chennai in 2016. Digital Chai Pe Charcha: Social Beat conducts a series of free workshops for startups called Digital Chai Pe Charcha, which allows first-time digital marketers to get a better sense of how to get ROI from their marketing efforts. After successful editions in Bengaluru and Chennai, it was also launched in Mumbai in 2017. The last event's topic was on ways of getting ROI from Digital Marketing and the Charcha went on between entrepreneurs and marketers from across industries which were the major makeup of the audience. Newer and first of its kind strategies were unveiled along with some really interesting takeaways. Conceptualized by the online video analytics & marketing company - Vidooly, StreamCon Asia 2019 is a one-stop congregation for content creators, video platforms and advertisers from the online video industry in India. It is one of largest event of its kind in India with speakers and panelists from UC Web, Indigo Airlines, Eros Digital, Fab India, Oyo Rooms, Trent, Dailyhunt and more. It will also feature many content creators and YouTuber Influencers giving it a power packed event for anyone who is leveraging video content. A niche awards night started by exchange4media in 2016, is now an annual summit. The last one took place on 7th September 2018. In the world of marketing, content has definitely changed the way marketers present their brands to consumers. As more and more brands choose creative content for engaging with their consumers, the need to stand out increases every minute. Indian Content Marketing Awards aim to promote and recognise this talent, expertise and hard work that go behind cracking breakthrough ideas & concepts to create exceptional brand stories. The Content Marketing Summit is also going to have an Asia Summit in Mumbai in May 2019 so watch out for that too. Adobe Symposium is one of the biggest Digital Marketing events in Mumbai. This event invites thought leaders in the field of digital marketing to redefine your experiences with Adobe partners. As their marketing promos claim – ‘Take it to another level, soar new heights like never before and extend your digital experience with courses straight from the Adobe Digital Learning Services’. Apart from these, there are several other reasons to attend this conference, including networking goals. This is the most sought-after experience for most digital professionals in today’s utmost competitive era and has been rightly defined as the event “Where digital marketing meets extraordinary experiences.” Every marketer looks forward to making the most valuable connections with their digital marketing pioneers and peers and if luck may have it, then with the digital marketing veterans and Adobe leaders too. The next Adobe Symposium in Mumbai is scheduled to take place on 16th April 2019 at Mumbai's Grand Hyatt. This is a grand event in Mumbai organized by the IAMAI (Internet and Mobile Association of India). It is an endeavour towards establishing a great comprehension of the modern methods and mechanics of marketing. Major Speakers were MDs & CEOs of leading companies such as Group M and Pepsico, top marketing managers of Times Internet, Starbucks, HDFC Bank, Kotak Mahindra Bank, eBay and Renault amongst others. There were Panelists to take the conversations to another level. The sessions were followed by networking breaks at regular intervals. Spread across three cities, the Paul Writer Brand Summit and Hot Brands 2019 is in its second year. The summit will focus on brand engagement, content marketing and marketing AI as an emerging trend in the digital marketing landscape. The summit will also feature a special segment on upcoming brands and startups as well as celebrating those brands that have achieved massive growth and accolades the past year. The summit will take place between 8:30 am to 6 pm in Bengaluru, Mumbai and Delhi NCR on February 8th, 15th and 22nd respectively. Since 2015, a two-city conclave has been organised by Reputation Today in the key metros, skipping the metro closest to the PRAXIS venue of that year. Having started in 2015 in Mumbai the conclave has seen 7 editions already. In 2018 there was one each in Gurgaon and Mumbai. Since PRAXIS will take place down south in Hyderabad, Bangalore will not witness the conclave. It is The Largest Digital Marketing Event in India. This conference generally takes place in September - October. This year it is scheduled to be held on September 4th and 5th, 2019 online. It is a Live Conference held as a response to the massive demand and the huge response it receives. Set your goals straight whether they are primarily aiming to reinforce customer loyalty, improve lead generation, increase sales, or even drive stronger consumer engagement, DIGIMARCON INDIA 2019’s agenda will enhance all your marketing efforts through perceptions of innovators and influential people. Pull up your sleeves for the sessions will enlighten you through remarkable insights through powerful talks on ways to build traffic, expand your brand awareness, improve customer service and finally know about today’s latest digital tools. A must-attend event that impresses you within 20 minutes, you can't afford to miss it. CMS Asia is a premier not-for-profit event organized by the thriving marketing community across JAPAC and ANZ. This year the summit is being held in four different cities – Sydney, Tokyo, Kuala Lumpur and Mumbai. CMS Asia will features speakers and attendees coming together to explore and discuss the various facets of content marketing, emerging trends, best practices and innovative though leadership. The South Asia leg of the summit will take place in Mumbai on May 8, 2019. IAMAI introduces the 14th edition of the Marketing Conclave - Game of Marketing. A Game of Thrones-themed one-day conference, where the work of marketing gurus and professionals come alive. Its taking place on 5th December 2018. Jaime Lannister, Daenerys, Khal Drogo or the popular favourite Jon Snow - we have watched them, loved them but now it’s time to live the glory of the kingdom with a twist. The 3rd edition of VdoNxt Asia is India’s largest convention for those who live by the promise of digital video. Having taken place on 17th January 2018, it is the complete experience: listen and network at the conference; get in touch with the latest in technology at the exhibition, and celebrate the best work in digital video at the VdoNxt awards. The next edition will only be in 2020 and there is no event scheduled for 2019. If you are based in Bengaluru, you may find it interesting to read our blog on Top marketing events in Bangalore. Do feel free to comment below or reach out to us in case you feel any other event in Mumbai deserves to be a part of this list. The World Marketing Congress and CMO Asia recognised the 50 most influential strategy leaders around the globe at the Mobile and Digital Marketing Summit 2018 held on the 27th of November at Taj Land’s End, Bandra, Mumbai. We are extremely happy to announce that Mr David Appasamy – Head of Brand and Strategy, Social Beat – has been selected as one of the top influential strategists from across the world. David has an exemplary career spanning over 35 years with several leading companies such as ITC Ltd, Mudra DDB and Sify Technologies covering Business strategy, Brand and Marketing Management, Digital Marketing and Audience Engagement. From 2006-2011, David was the Co-Chair for the International Chamber of Commerce’s Task Force on Internet, Telecoms, Infrastructure and Services. In 2010 and 2011, he was also part of the Multi-stakeholder Advisory Group (MAG) guiding the UN Secretary-General on Internet Governance. The 5th edition of the World Marketing Congress was held this year with the central theme of Futuristic Marketing. The conference covered various aspects such as digital initiatives, customer experience, advertising and branding. The conference also discussed the importance of linking sustainability with a brand’s identity and how to develop a sustainable brand by changing the dynamics of marketing strategies. Various industry experts also stressed the need for brands to focus on their marketing culture rather than only their products and services. The other key aspects that were highlighted are the role of brands in empowering customers by using interesting engagement initiatives to create brand perceptions and nostalgic memories. This year’s World Marketing Congress also included the 8th edition of the Mobile and Digital Marketing Summit. This summit was organised jointly by the World Marketing Congress and CMO Asia. The main purpose of this summit was to discuss the future trends of digital marketing and the need for every brand to incorporate effective digital marketing strategies in order to establish a strong presence in today’s continuously evolving digital landscape. This summit was a great platform for industry experts to gather, explore, discuss and brainstorm ideas on formulating compelling strategies to reach India's next billion Internet users using digital marketing tools, case studies and global practices. 100 marketing wizards attended the summit from across the globe including market research experts, brand strategists and media professionals to discuss and ideate the best industry practices. You can also read our other blogs on the top digital marketing events in India in 2019 and the second edition of our Digital Leadership Summit. We are happy to announce that our co-founder Vikas Chawla, Head of Social Media Innovation - Anuradha Nair and Creative Head - Panisa Shah have received nominations under the first edition of Social Samosa’s 40 Under 40. Social Samosa 40 Under 40 is a salute to pioneers in the field of marketing and advertising in India – to celebrate thought leaders and entrepreneurs who have disrupted and impacted growth within the ecosystem. Google India’s Year in Search report estimates that by 2020, more than 650 million Indians will be online. In the last two years, digital underwent a major paradigm shift – from a support-marketing channel to a full-fledged business platform of its own. According to the Digital Marketing Industry Report 2018 that we recently released, 68% of brands leverage digital marketing to promote their products and services. Those nominated for #SS40under40 are those individuals who strive to leverage our country’s growing digital audience and formulate the best strategies to engage with the next billion internet users in India. The nominations are spread across 10 categories namely - Account Management, Analytics, Brand Management, Business, Content Marketing, Creative, Digital Marketing, Media Entrepreneurship/Leadership, Media Planning, and Strategy. Each candidate is nominated and assessed based on creativity, planning and execution, strategy, ability to analyse numbers and trends and implement them, crafting their brand’s message and how effectively they engage with consumers. Babita Baruah - Managing Partner, WPP GTB India. We wish good luck to our Social Beat members in the final selection! At Social Beat, being imaginative and innovative is part of our DNA. We work hard to reach our client’s goals and exceed their expectations. So it’s always a wonderful feeling when accolades come our way! The recently concluded Big Bang Awards 2018 by The Advertising Club, Bangalore was a celebration of India’s digital advertising talent. Social Beat won Silver for the Digital Award in the Real Estate Category. We were recognised for our stellar work for Brigade Group – the leading player in India’s real estate industry. Awards like this prove why real estate brands need to shift from print to digital. Established in 1986, the Brigade Group has a pan-India presence with a diverse portfolio that covers both commercial and residential properties. Apart from property development, Brigade’s repertoire also includes property management services, hospitality and education. Brigade approached us with a simple objective - build user-generated content and create a buzz around Brigade’s social media handles. Keeping this in mind, we came up with a photo contest idea. While the campaign was centred on audience interaction, it reaped a two-fold benefit – the pictures sent in would promote Brigade and thus increase visibility, as well as encourage people to follow the company across social media platforms. One of Brigade’s top priorities before the start of any campaign is to be as unique as possible, and the Photo Contest campaign did just that. Brigade’s audience was able to actively engage with them. Each participant had to send a maximum of 5 images, of which at least two had to feature Brigade properties. Participants also needed to add specified hashtags to their posts and follow them on social media platforms. This helped Brigade gain visibility and increased their social media followers. To help spread word about the campaign, we created a small video that held all the details. The results achieved were staggering. In fact, this campaign also won Silver for the Best Social Media Brands under the Real Estate category at Social Samosa’s digital marketing awards. There were over 15,000 views and engagement of more than 30,000 people, with more than 3000 clicks. We received over 500 entries in response to the campaign. The majority of our audience was between the ages of 18 to 24. This one-of-a-kind approach to creating engaging real estate marketing strategies is what sets Brigade apart from their competitors. This award is further proof of Social Beat’s commitment to pushing the boundaries and delivering only the best in digital marketing for our clients. You can also read our Complete Guide To Digital Marketing For Real Estate for more insights. Our creative, quirky campaigns have always won the hearts of our clients, but when they win awards too, it’s always an added perk! The 2018 edition of Social Samosa’s much-anticipated digital marketing awards was held on July 31 and included 19 categories with 14 special categories. Social Beat has won two Silver awards for the Best Social Media Brands under the Real Estate category. This was in recognition of our exceptional work with Brigade Group and Casagrand, two of the largest real estate developers in South India. These awards are further proof of why real estate brands need to shift from print to digital. Casagrand is one of the most reputed developers in South India, with a 14 year legacy behind them. Established in 2004, Casagrand has developed over 12 million sq.ft. of premium residential real estate across Chennai, Bengaluru and Coimbatore. Their core values of innovation and quality have translated into their engaging real estate marketing strategies. Some of their best-performing social media campaigns were able to tap into the variety of emotions that make a house a home. The #FeelAtHome campaign by Casagrand was a creative representation of the small things that make our homes special. This campaign featured day-to-day things most of us do, but often take for granted. Each post was crafted along the lines of the philosophy that it’s emotions that go into making a home and not just four walls and a ceiling. This post, for example, depicted a colourful rangoli, a staple at the doorway of almost every South Indian household. It performed very well on social media as a large part of the audience were able to relate to it on a personal level. The familiar feeling of waking up in the morning to the sight of rangoli being drawn at the entrance of the house is something most had grown up with. One of the factors contributing to Casagrand’s win was their willingness to experiment with new formats and push the boundaries. During the Wimbledon season, we created a 3D post for Casagrand, which also acted as a quiz for the audience. It featured a tennis ball and users could move the 3D image around to check which side of the court it was on. The post was also able to creatively plug in a mention of Casagrand’s amenities in a non-intrusive way. The Brigade Group, first established in 1986, is focused on property development. Apart from residential properties, Brigade has a multi-domain portfolio covering commercial property development, property management, hospitality and education. The same attention to detail and drive for excellence that sets their projects apart also drives their social media marketing strategy. One of Brigade’s key differentiators is their unique way of showcasing new project launches. For Brigade, we have looked past the usual promotional posts and instead, depicted new projects in a way that captures their true essence. For the Brigade Woods launch, we structured the entire campaign around the abundance of greenery that was the biggest USP of the project. These watercolour-style posts depicted the joy that comes with owning a house in the midst of lush green spaces. Brigade’s social media approach also involves using creative ways for their audience to actively engage with them. One of the best-performing contests by Brigade is a photo contest. Each participant had to send a maximum of 5 images, of which at least two had to feature Brigade properties. Participants also needed to add specified hashtags to their posts and follow them on social media platforms. This helped Brigade gain visibility and increased their social media followers. These awards are further proof of Social Beat’s commitment to pushing the boundaries and delivering only the best in digital marketing for our clients. While bidding farewell to 2017, Google India came out with a comprehensive report titled, ‘Year in Search’ which throws light into the way Indian consumes content. Google’s annual report offers a unique perspective on India’s most significant trends, major events and local and topical interests that reflect the ever-changing psyche of India’s online millions. As of 2017, India’s internet users were estimated a little north of 400 million. Today, that number is closer to 450 million. While that number constitutes less than 30% of our total population, it is the second largest online market after China – and it is only growing. By 2020, the Year in Search India report estimates more than 650 million Indians will be online. That’s double the population of the United States. Every day, more and more Indians are discovering the internet and integrating it into their daily lives – to look for information, entertainment, answers and everything in between. The report spans 11 verticals and delves into consumer behaviour to reveal what goes on in the minds of India’s next billion internet users and the implications this has for brands and marketers. Here are the top five emerging trends identified in the report. Non-metros in India are quickly catching up with the major cities regarding internet usage. Voice, vernacular and video are three key pillars that are showing strong and steady growth. 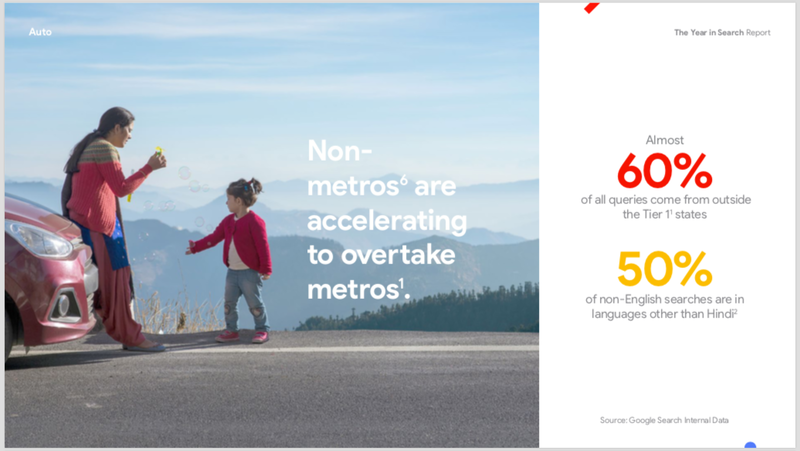 Search queries are growing at a faster rate in non-metros than metros. In fact, 2 in 3 queries are from non-metro cities. And given the growth of regional content online, Hindi is of course still the dominant language; other regional languages like Bengali, Telugu, Marathi, Gujarati, Tamil, Kannada, Malayalam, and Punjabi are swiftly gaining prominence online. This only goes to show that brands would have to focus on Tier II and III cities and digital marketing strategies would have to focus on languages apart from English. This is the only way to reach the right target audience. 2017 saw digital undergo a major paradigm shift – from a support-marketing channel to a full-fledged business platform of its own. According to the digital marketing industry report that we recently released, 68% of brands leverage digital marketing to promote their products and services. Sectors like auto, banking, finance and insurance (BFSI) showed a direct correlation between online research and offline purchase. A leading OEM’s sales were driven 20% by digital. Similarly, sectors like FMCG and banking saw entire transactions being carried out online. Consumers relied on Search to educate themselves and discover products before finally converting online. For instance, consumers not only searched for hair care tips online but also looked for products that would help them solve their hair problems. As per the report, the Internet will influence $45 billion of FMCG sales in India. This is further proof of how digital will revolutionise the FMCG sector. Growth spurts in e-commerce, travel, finance and digital media have driven online consumer expenditure, which is expected to grow 2.5 times to $100 billion by 2020. Furthermore, the report projects that India’s online spender base will expand 2-3x its current volume to reach an astounding 180-200 million by 2020. There was a 70% growth in Telco-owned owned mobile wallets like Airtel Money, Vodafone mPesa, etc. All these figures point to a robust e-commerce ecosystem. The online and offline are merging to create a holistic story. The lines between digital and physical consumer behaviours continue to blur. Take for example – a 50% increase in search volume for “stores near me” indicating that online searches for stores are an now an integral part of a consumer’s shopping experience. Similarly, the auto industry saw an astounding 79% of car buyers making purchases after watching a video online. These examples reinforce the fact that what happens online directly affects what happens next offline. Newer technologies like AI and machine learning are upping the ante, leveraged as marketing and business solutions. Across categories, Google’s Year in Search shows several examples of a market primed to take on the benefits of AI and machine learning. India’s auto industry saw intending car buyers take favourably to 360-degree video and virtual reality, which could potentially replace test drives. Insurance players turned to AI-chatbots to efficiently answer user queries at scale. Concurrently, content consumption patterns on video viewing platforms continue to be influenced by machine learning. As per the Google trends in India report, online searches related to the auto sector are on the rise. This is more so in non-metros where digital sales drove 20% of original equipment manufacturer (OEM) sales. Two wheeler insurance saw a 100% increase in queries, while searches related to parts and accessories and servicing saw a 43% and 70% rise each. The report also states that car buyers are now looking for a more omnichannel experience. This is evidenced by a 50% reduction in offline touch points during the buying process. Car buyers are relying more on the internet for videos regarding their vehicles and virtual test drives prior to finalising. In fact, 71% of consumers believe VR test drives and 360 videos could replace the conventional method of test-driving a vehicle. Videos are the simplest way of building your brand and utilising the video medium was one of the key digital marketing trends of 2017.
Business and personal home loan queries saw a massive surge, as did searches related to banking solutions and information about mutual funds. 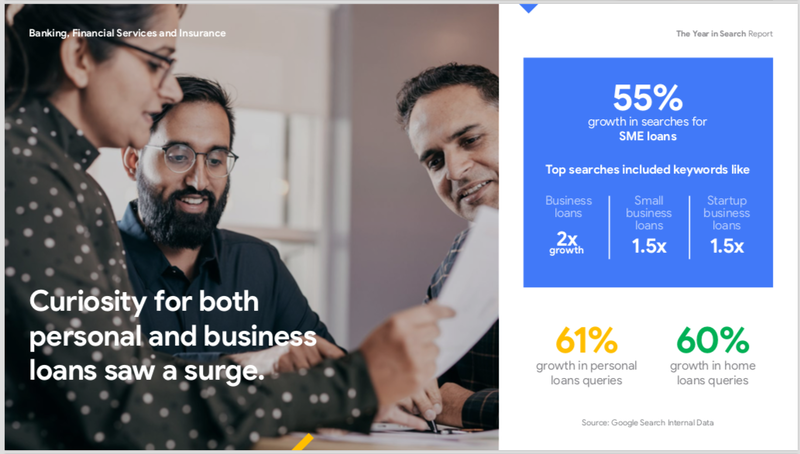 BFSI brands have also seen a significant impact on driving consideration and overall digital acquisition as a result of using a “search bar” as a call to action. Businesses also began utilising machine learning for speech to text translations and sentiment predictions in their call centre transcripts, all of which have resulted in a seamless experience and improved efficiency for customers and businesses alike. All in all, leveraging digital marketing for the financial industry has proved beneficial. 2017 was a good year for the e-commerce sector. There was a 41% growth in shopping queries, most of these coming from non-metros. The most significant growth markets are Patna, Lucknow. By 2020, digital spending and women shoppers are expected to grow by 2.5x. 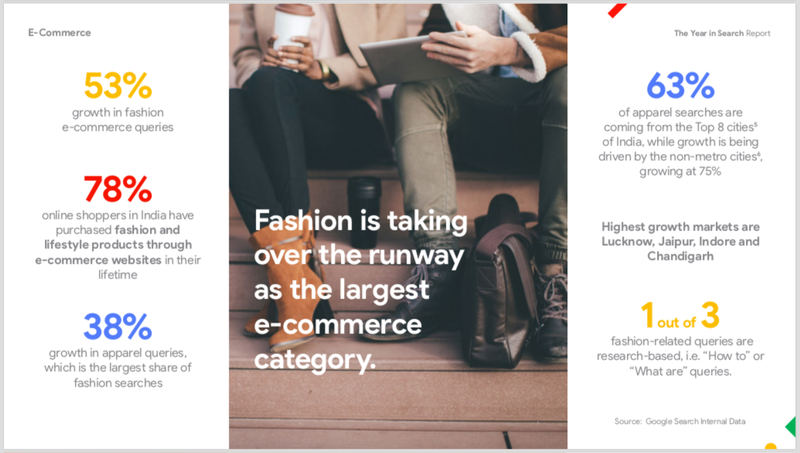 The largest e-commerce category is fashion with a 53% growth in fashion e-commerce queries. Other fast-growing sectors include baby care, growing at 36% and groceries showing an average growth rate of 65-70% between 2017 and 2020. The report evidences that online shopping is increasing beyond India’s metros; searches in Hindi and other regional languages have gone up by 61% with Hindi commanding the highest share. Education is rapidly coming up online; it comes as no surprise that learning and education related searches grew by 2x, while education content on YouTube grew to 4x. 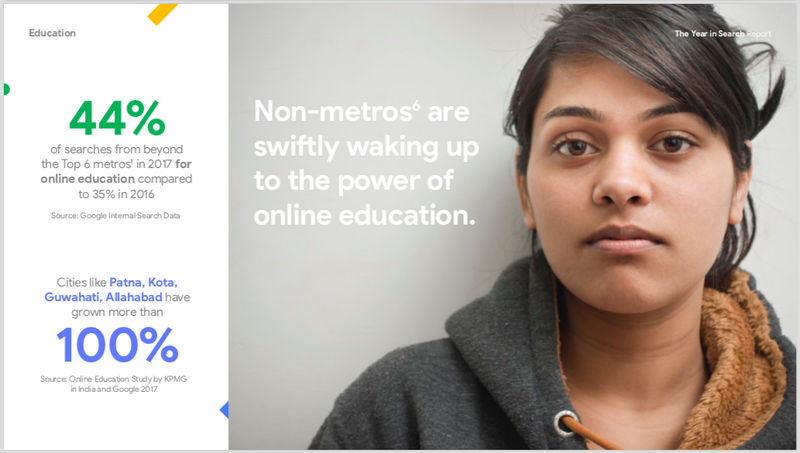 Non-metros showed more than 100% growth, with maximum interest in courses that taught new technology, i.e. machine learning, cloud computing, artificial intelligence. Digital is spearheading business for the FMCG category, particularly the beauty industry. 2017 saw a 60% increase in beauty related searches and searches related to parenting and baby care buying decisions. 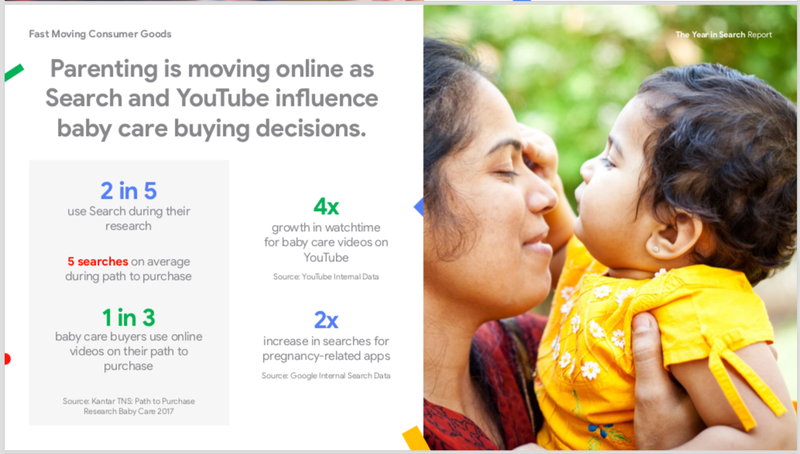 Much of this is also influenced by YouTube as there is a 4x growth in watch time for baby care videos. According to YouTube Brandcast 2018, more than 50% of women professionals watch YouTube videos for more information before purchasing in categories like beauty, real estate and automobiles. Trying this for one of your FMCG clients, On1y, we created an unusual video to advertise their brand and to keep their viewers engaged. The overall reach for the video was over 10,000,000, the total views on YouTube were over 480,000. Online gaming is showing a staggering growth rate; online gamers are expected to reach 310 million by 2021. There was a 2x growth in online gaming queries, with 55% of them coming from outside of the top metros. There was a 70% growth in online food ordering and home deliveries, with 4 lakh orders daily on average. Foodtech startups like Swiggy Zomato have completely transformed the way urban India eats, and currently, rule India’s food tech landscape. Google search is also playing matchmaker and headhunter with a 40% increase in job searches and a 38% growth seen in dating app searches and matrimonial websites. 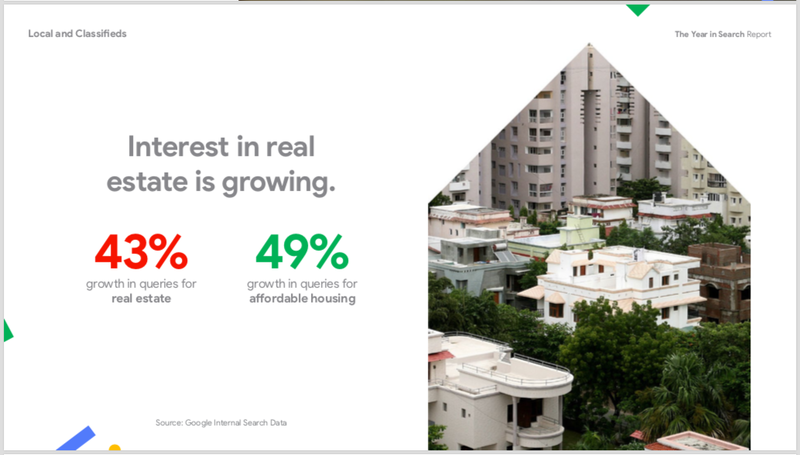 Real estate, too, saw a 43% jump in search queries and a 49% growth in searches related to affordable housing. Showcasing properties on digital platforms is one of the most effective ways for developers to sell their properties. With a multitude of techniques including advertising on various platforms, multilingual content and a strong search engine marketing, real estate developers can generate even a 190 crore in revenue using the digital media. Regional content ruled all aspects of entertainment with a 100% growth in vernacular entertainment watch time on YouTube. There were high conversions and growth in watch time when viewers were exposed to a TV ad for a show online. We have witnessed first-hand the power of regional content on YouTube. For the ‘Good Netizen Good Citizen’ Campaign by The Murugappa Group, we at Social Beat conceptualised for a video that would resonate with their audience base. Since The Murugappa Group is based out of Tamil Nadu, Tamil language content would be more natural for their audiences to understand and relate to. These videos performed incredibly well on YouTube - one of them even received over 570,000 views. Users actively engaged with the video, commenting and sharing it on various social media platforms. Providing shoppers with an omnichannel shopping experience is proving valuable for businesses. 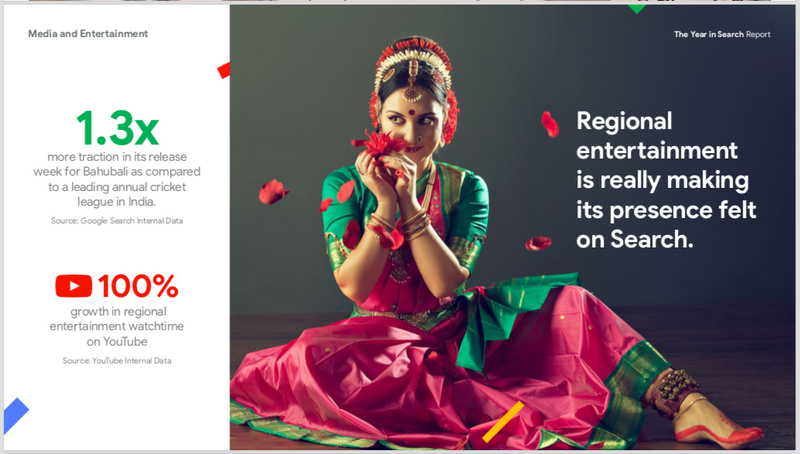 Shoppers Stop worked with Google to connect their offline sales with their digital marketing spends. This got them a 2.5x Return on Ad Spends (ROAS). 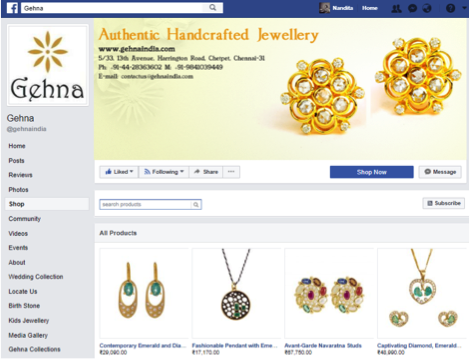 Our client Gehna, too, follows an omnichannel approach with a physical boutique and presence online, selling on Facebook, Amazon and on their website. Indians in non-metros embraced India’s fast-growing internet penetration and used it to research before buying new gadgets, which resulted in a 45% growth in queries for consumer electronics. New and niche technologies also witnessed a boost in search queries to the tune of 3x more interest in smart home devices and 2x growth in both in smart homes, appliances and lighting, and smartwatches and fitness bands. Business-related tech took off in a big way as well, with an increased interest in accounting software, website builders and HR and finance/payroll categories. With the advent of 4G in India, most of our internet traffic this year came from outside India’s top eight cities. Consumption patterns fluctuated with searches for mobile data jumped to 70% for 4G and dropped to 30% for 2G and 3G. With the top 4 telcos offering competitive prices, consumers took full advantage – searches for offers shot up by 141%. There was a substantial increase in payment bank searches – nearly 174% as consumers are now looking beyond cash and card payments. India loves to travel, and by 2020, the Indian travel market is poised to hit $48 billion, with Tier 2 cities leading this growth. 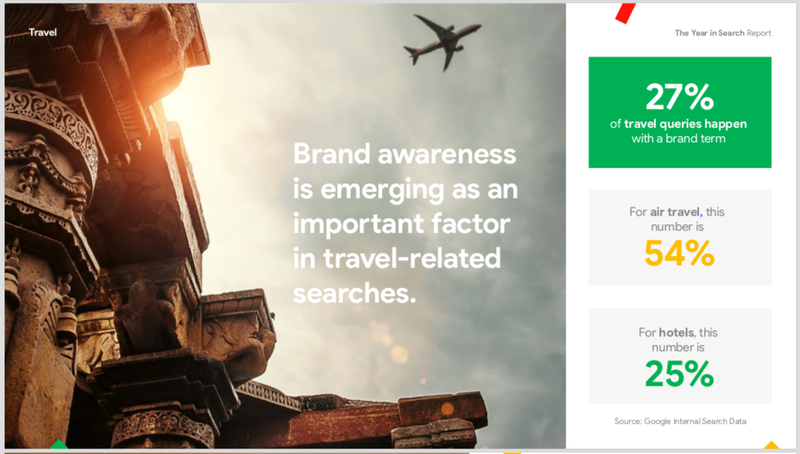 Voice and fast loading mobile experiences and brand awareness are emerging key factors in travel-related searches. This report only proves that digital marketing is the most important medium to market your brand. Whether you are a real estate giant or an FMCG brand, if you have an ambitious project in mind, reach out to us. For more information, insights and opportunities in your vertical, download the report here. Mary Meeker’s 2018 Global Internet Report: Where does India stand? The 2018 edition of Mary Meeker’s eagerly anticipated Internet Trends report is out and provides one of the most comprehensive insights into the global digital landscape. This year, the report covered a wide range of important themes from mobile usage and the rise of cryptocurrency to work patterns and immigration. One of the most important topics covered was the rise of China’s technological growth and how it will very likely overtake the US in terms of innovation and advancements. While the 2018 report hasn’t covered India in depth, it is still an excellent barometer by which we can understand how the digital landscape here compares to the rest of the world. India’s internet growth has followed a very different path due to several factors that are unique to the country. While the US and China are already massive established markets, India’s strength lies in the fact that this is still an emerging market. This presents a huge potential waiting to be tapped into. Here are a few key takeaways from the Mary Meeker Internet Trends Report 2018 and how India compares. 2018 records the highest number of people on the internet. Almost half of the global population, around 3.6 billion, are now connected via the internet. One of the reasons for this is the growth of WiFi networks across the world. Today there are around 450 million WiFi networks globally, as compared to five years ago when there were only around 100 million. In India, however, it is not so much WiFi that is spearheading the growth of the internet, but mobile data. Drastic reductions in the price of mobile data have made the internet more accessible to all sections of the population. One of the catalysts for this development was the launch of Jio. Of the 150 crore GB of mobile data consumed by Indians, 100 crore GB was through just the Jio network. Google has made some strides with its Rail Wire initiative and there is free WiFi available in over 370 railway stations. They recently reported 7.5 million users consumed 7,100 terabytes across these stations. Additionally, 80% of all enquiries come in through mobiles. Because of this, mobile platforms are becoming increasingly important for brands. Speed and convenience are two of the most-valued features in Indian markets. This is why brands here are beginning to adopt a ‘mobile-first’ approach and utilise AMP-implemented landing pages to improve a user’s experience and generate higher leads. Global internet adoption rates are growing slower than they ever have. In 2017, internet user growth stood at only 7% as compared to 12% the previous year. This could be because since most people are already connected to the internet, there are fewer new users to be added. In India, however, a completely different scenario is unfolding. Up until 2016, Indian internet users were growing at an incredible 28% annually. Mobile data, cheaper smartphones and growth of vernacular content online has played a pivotal role in expanding the internet beyond just urban areas, into tier 2 and 3 cities and towns. Most significantly of all, internet penetration in India stands at only 27%. This shows that there is a huge opportunity for brands to take advantage of as internet adoption in the country continues to rise. While the total time spent on mobile devices is increasing, 2017 marked the first year where smartphone shipments showed no growth. Again, this could be because the number of smartphone users around the world has more or less plateaued. The year also witnessed a paradox, wherein despite some of the most expensive phones such as the iPhone X and Samsung Galaxy Note releasing, global average smartphone prices are falling. As a fast-growing market, India’s smartphone sales figures were markedly different. Counterpoint revealed that India recorded an incredible 48% YoY growth in Q1 of 2018. The demand was for affordable smartphones which still provided a wide range of features. It comes as no surprise, therefore, that Chinese phone brands known for providing just this dominated the market. Of the 10 top selling phone brands in 2017, 6 of them were by Chinese manufacturers. While consumers in the US are spending more time than ever on their smartphones, mobile advertising budgets are not reflecting this. An average adult in the US spent around 5.9 hours on their mobile phone each day in 2017 as compared to 5.6 hours in 2016. But while advertisers are slowly branching out into mobile advertising instead of just traditional advertising, this shift isn’t happening fast enough. While 29% of time is spent on mobile, only 26% of advertising budgets are used for mobile platforms. This has resulted in a $7 billion gap that brands need to take advantage of. In India, this potential might be far greater. As the country begins to benefit from cheaper mobile data and smartphones, higher digital literacy and greater access to digital content online, the number of hours spent on their phones will also increase. Currently, Indians spend 89% of their total online time on mobile data, far greater than the US average of 29%. Because of this, a study by Nielsen and BCG identified a $100 billion opportunity for digital consumer spending in India. One of the biggest contributing factors for this was the growth of mobile internet in the country. One of the biggest trends in 2017 was the advancements made in voice technology. Google’s Machine Learning technology achieved a 95% accuracy, which is the same as that of a human. Amazon Echo’s sales also skyrocketed to 30 million in 2017 as compared to 10 million the year before. Consumers today are more willing to use voice search as accuracy and convenience of the technology improves. As Google’s Indian language voice search accuracy improves, more Indians are beginning to use it as well. 28% of all searches on Google in India are voice searches. There has also been a 400% growth in Hindi voice search, indicating the willingness of users to perform voice searches in vernacular languages. The Google India Search Insights 2017 also showed that there was a 63% jump in data/voice usage. Moreover, 7% of all travel-related queries were through voice. Google Home and Amazon Echo were also launched in India recently, however, they do not support Hindi as yet. It remains to be seen how the lack of Indian language recognition will impact their adoption in India. Amazon is by far the biggest player in US e-commerce sales. In 2017, it had a 28% share of the e-commerce market, with $129 billion in Gross Merchandise Volume (GMV). To put this into perspective, it had only a 20% share of the market in 2013, with a GMV of $52 billion. The report also showed that most product searches today happen directly on Amazon. While 36% of product searches are conducted on a search engine, 49% of them are started on Amazon. But while Amazon is the biggest e-commerce player in the US, at $701 billion, Chinese e-commerce giant Alibaba has a much higher GMV. Back in India as well, Amazon is growing at a breakneck pace. In FY2017, Amazon announced that it had grown in its revenue by 105% in India. The number of app downloads for Amazon crossed 100 million by November 2017, with around 4.8% users visiting the app every single day. In the five years since its launch, Amazon has overtaken homegrown e-commerce companies like Flipkart and Snapdeal. The only competition for Amazon India could be Alibaba who has also announced plans to expand into Indian markets. These findings prove that India’s rapidly expanding market presents a huge opportunity that brands cannot afford to ignore. As more Indians continue to come online, India will soon become an important player on the global digital stage. Will Facebook’s updated terms and data policy affect brands in India? After the Cambridge Analytica controversy, Facebook has taken several important steps to tighten their data security. The multi-billion dollar social media platform recently announced a new set of amendments to their data policies. The question that has arisen is whether or not the recent changes in policies will affect brands and their advertising strategies. However, most of the new terms involve reiterating existing ones, which is unlikely to affect brands’ marketing strategies. Here are some of the most important announcements Facebook has made about their revised data policy and the impact it is likely to have on brands. One of the most significant policy changes Facebook is making is to revoke access to user information for third-party apps that haven’t been used by them in over three months. There will also be a more visible button on the news feed which will allow users to restrict access to certain apps by themselves. Impact: This change will only improve privacy and safety for users with zero impact on brands and advertising. Since apps that users consistently engage with will not be affected, brands will still have access to their main target audience. Impact: This new policy is a step in the right direction towards better security for users. The improved privacy settings will help users be more confident about actively participating on the platform. For brands, this is a positive change as it means that their consumer base on Facebook will remain largely the same. Earlier, through a feature called Partner Categories, advertisers on Facebook could target consumers based on very personal insights provided by third-party data agencies. But now after details of these providers exploiting private user data has come out in the open, Facebook is shutting down Partner Categories. Impact: The Partner Categories feature allowed brands who lacked an existing customer database to find a target audience. While brands can continue using Facebook’s database as well as their own customer data through the Customs Audience tool, the exact impact of this change is yet to be seen. Users will now be able to decide which ads they want to see appearing on their newsfeed. This is also an important step towards personalisation of a user’s newsfeed. Impact: This feature has always existed on Facebook, the only difference now is that it will be more prominent. As long as brands are using the right targeting, they will be unaffected by this change as users will be interested in their ads. Brands with inaccurate targeting, however, are very likely to be negatively impacted. Advertisers who upload their existing database onto the custom audience tool will not be able to see the exact reach of their targeting. This is to prevent advertisers from being able to see exactly how many of their customers are on Facebook. Impact: While advertisers will not be able to see the exact reach when using the Custom Audience tool, they will still know how many customers were in their database. This will give them a reasonably accurate idea of how big their reach is. The revised data policies are unlikely to have any significant impact on the way people are using the platform. Currently, India is Facebook’s biggest market with 240 mn monthly active users, overtaking even the US which has 230 mn. Far from decreasing anytime soon, these numbers are only going to grow. By 2020, there will be around 250 million new smartphone users and 100 million new internet users. A significant portion of these users will also start using Facebook. For brands, Facebook is and will continue to be one of the most effective ways to reach out to their consumers. Despite the new terms and conditions, the number of Facebook users in India has not shown any significant decline, nor is it expected to. With their customers still active on Facebook, brands need to maintain a strong presence on this platform in order to build brand awareness and encourage customer loyalty. Advanced social media analytics tools, can also provide detailed targeting for brands. As the number of users will only continue to grow from here, Facebook remains one of the most important platforms for brands to engage with India’s next billion internet users. As our Digital Marketing Industry Insights for India 2018 also points out, Facebook is one of the best-performing platforms to help brands meet their business goals. Through Facebook, we have even been able to generate a 190 crore revenue for Casagrand. The recent privacy changes Facebook has implemented is a positive step towards protecting a user’s personal information online. Brands in India are unlikely to face any negative impact over this decision as the number of Facebook users are only going to grow from here. Whether you are an enthusiastic start-up or a well-established organisation, there is no doubt that you are missing out on a pool of potential customers by not tapping the reach of digital marketing. Keeping this notion in mind, Social Beat and Google were proud to collaborate for yet another insightful session of Digital Bites. The event took place on the 9th of March at Bangalore, with thoughtful insights presented by industry professionals. The session focused on the importance of Video Marketing and how top video sites like Youtube are emerging as an alternative channel to television. It also threw light on the growth of regional content and how brands can leverage the ease of voice search to engage with India’s next billion Internet users. 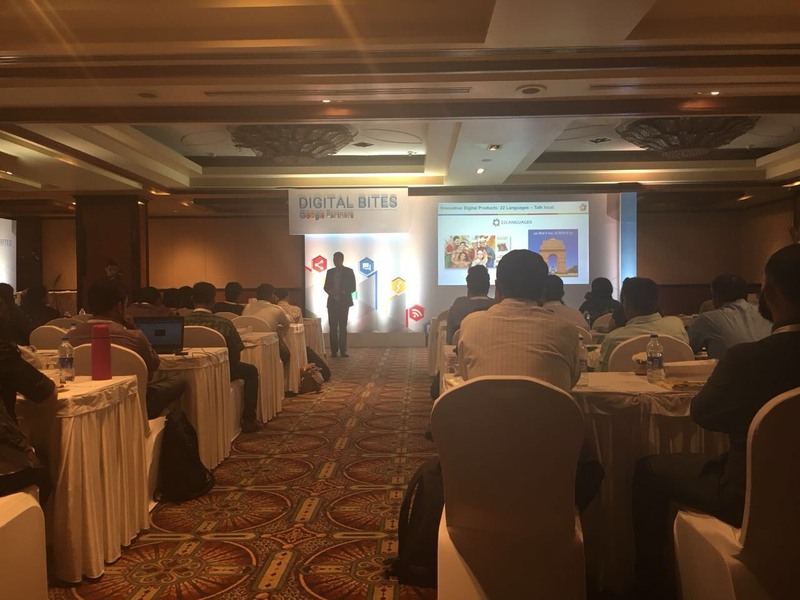 The previous Digital Bites session was held in Chennai during September, 2017. Make sure you read our blogs on Digital Marketing and Social Media Marketing for deeper insights. Over the five years since our inception, Social Beat has consistently pushed the envelope and stood at the helm of digital innovations. This relentless drive towards perfection has been a key factor in the successful business results we have achieved for each of our clients. But the digital landscape within which we operate is continuously changing and with it, so are we. As we progress from being a startup to a meaningful player in the digital ecosystem, we are charging head-first towards a phase of rapid growth and impactful creativity. To keep up with our constantly evolving nature, we have re-launched our brand identity to better reflect the values we strive to embody today. But while the overall look of our brand might have changed, our core promise remains the same: to achieve measurable milestones for our clients through ROI-driven digital marketing. Social Beat today is a powerhouse of talent, creativity, strategy and innovation. With our vibrant 80-member team spread across our offices in Chennai, Bangalore and Mumbai, we have the best resources to help brands meet their business objectives. With our unparalleled capabilities in the field, we can say with full confidence that no one understands the digital landscape of India better than us. Social Beat has several unique tools at our disposal to meet the challenges and potential of India’s consumer audience today. As the importance of video marketing continues to grow, our expertise in creating engaging, insightful video content is one of our biggest strengths. With a talented in-house video team, we offer brands a special edge to capture the attention of their consumers. Influencer by Social Beat is one of our most important services, capitalising on the rapid emergence of influencer marketing. Through Influencer, we put brands in touch with key influencers in the category, helping them achieve greater brand awareness and trust. As tier 2 and tier 3 cities in India benefit from easier access to high-speed internet and low-cost phones, regional language marketing is crucial to help brands engage with India’s next billion internet users. This is why 22 Languages by Social Beat helps brands create engaging content for their audiences in the language they are most comfortable in. This focus on results through a comprehensive marketing strategy is perfectly encapsulated in our new brand identity. The new brand identity symbolises the progressive vision of our company. From the choice of contemporary fonts to the colours used, every aspect of the logo is an embodiment of the values, culture and innovative methods used by us. After weeks of brainstorming and ideation, our in-house creative team led by Creative Head Panisa Shah finally conceptualized a logo that was the best representation of all that our brand stands for. We adopted a clean, minimal and contemporary look to symbolise our progressive approach to digital strategy. Aside from our new logo, our brand relaunch also involves a redesign of the Social Beat website. In keeping with the minimalist theme, we are giving our website an uncluttered, clean layout that is captivating in its simplicity. The brand new Social Beat logo is minimalistic and contemporary with clear-cut edges and a bold, yet refined design language that is reflective of our distinctive identity. It successfully captures our passion, energy, creativity and professionalism in a memorable way. Every component of the logo has a symbolism of its own that throws light on the values, ethics and passionate spirit that defines who we are. Solid colours with a rock-solid approach: The colour strategy behind the logo was to combine the enthusiastic vibe of orangish red with the reliability and expertise of royal blue. A typical day at Social Beat is replete with vibrant minds working towards reinforcing our clients’ trust and confidence in us. This is why we chose a vibrant red to represent our fresh ideas, passion, creativity and energy, while royal blue represents our dependability and trustworthiness. Bettering the lettering: We opted for an uppercase, clean, sans-serif font to portray the professionalism we offer. The straight lines reiterate our commitment towards providing polished, masterful end-results for our clients. Forward is the way to go: The forward arrows represent the result-driven business generation approach and the progressive vision of the company. We are constantly scouting for the latest trends in digital marketing to ensure that brands stay ahead of the curve. Energetic, enthusiastic and youthful: The strategically placed flash symbol symbolises the energetic and dynamic nature of the team, driven by fresh ideas and new-age concepts. Strategy comes full-circle: The circle encompassing the logo stands for the holistic digital marketing solution that Social Beat offers to each of our clients. Our re-envisioned brand identity will accelerate us towards our goal of becoming amongst India’s top companies offering digital marketing solutions. This new identity resonates with our USP of boosting ROI for our clients across a variety of sectors like the finance industry, FMCG industry, real estate sector and more by being a holistic digital marketing partner. It's a brand new identity but the same bold promise! Our co-founder Suneil Chawla was recently featured in Deccan Chronicle in a short article titled A more ‘personal’ Facebook. The article focused on how Facebook users felt the platform was primarily used to connect people together across the globe but is now like a Classified showcasing products, services and other events related to the them. To address this concern, Facebook has now changed its algorithm in such a way that it will favour personal posts which have more engagement with viewers rather than promotional posts put up by organisations and news hubs. “As a Facebook user I believe it is a great move as we can see more content from friends and family. As a brand, anything good for the user, can’t be that bad for a meaningful brand”, he added. You can check out the entire article here. There is no doubt that digital marketing will transform the real estate industry in 2018. However, the recent implementation of RERA has caused a huge shift in the way marketing strategies are created and conducted in the property sector. The much-anticipated Real Estate Regulatory Act has made developers rethink and reformat their marketing strategies to comply with the guidelines for the promotion and marketing of properties. Our Head of Brand and Strategy, Mr. David Appasamy, was recently interviewed by Realty Plus Mag about this topic. In this interview, David gives us his thoughts about how the game of real estate marketing has changed with the introduction of these major policies. Audience engagement has always been a challenge for most brands and companies. Reaching out to your target group is just half the battle won. The key lies in engaging your viewers to an extent in which they ultimately convert to loyal customers. One such digital marketing trend that has emerged as an effective tool to keep customers engaged with your brand is Live Videos. The advent of live videos has changed the face of audience engagement for the better. The live video streaming option is available on all leading digital marketing channels such as Facebook, Instagram, Twitter and YouTube, to name a few. With live streaming, like Facebook Live, companies have a cost-effective mode of promotion that audiences can easily view since studies have shown that there has been an increase in the viewing of live videos after the introduction of the 4G network. There are many benefits and drawbacks of the usage of live videos but overall, it has been found to be an extremely effective method of communication and engagement between brands and audiences. Social Beat believes in the power of live videos for promotion and marketing. 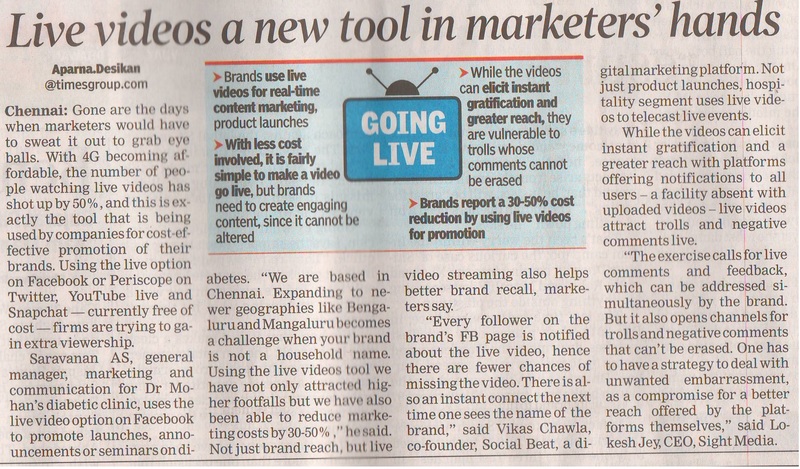 Featured below is Times of India's article where our co-founder, Vikas Chawla, gives us clarity on how live videos can benefit your brand and help you reach your marketing goals. For more insight on Live streaming, make sure you check out our blogs on the top 10 live chat software for your website and 4 tips to integrate social media for live events. Social Beat is proud to be featured in the Social Samosa Yearbook 2017 for our spectacular campaign executed for our client, Notion Press. Our featured campaign is listed under the Media and Entertainment category. The objective of the campaign was to create a buzz about the launch of the book, The Great Indian Obsession by Adhitya Iyer. The book is an interesting read on how Indians are obsessed with Engineering with a twist of humour. The campaign too, was a reflection of the book, with a funny hand-drawn cartoon sketch. 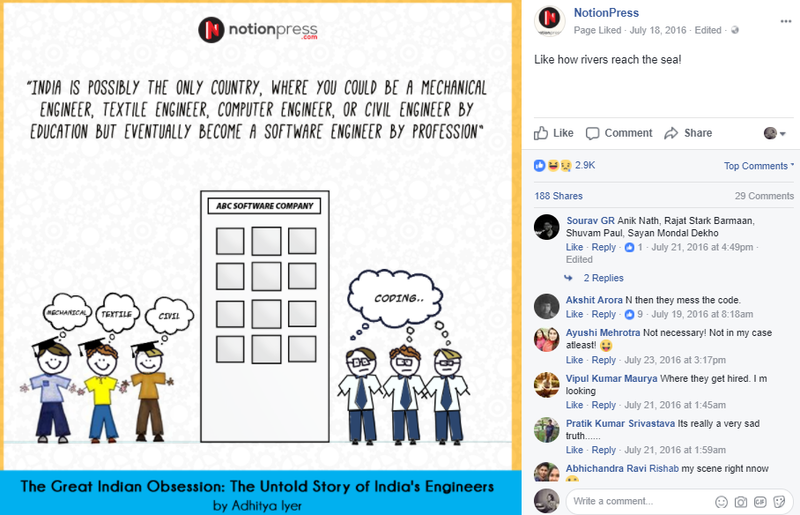 Titled as Bizzare Engineering Facts, it took a light-hearted approach in showcasing quotes from the book, throwing light on hypocrisy in education. The campaign was exclusively posted on Facebook and Twitter and clocked a reach of half a million, with 21k likes and 986 shares. Its relatable context made it an instant hit amongst the target audience and eventually landed us with a feature in the much-awaited Yearbook of Social Media Campaigns 2017. The updated 2017 version of the book is packed from cover to cover with over 60 eye-catching social media campaigns which are guaranteed to inspire you. These campaigns have created a stir in the digital space and are the best performing campaigns of the year. Apart from mind-blowing campaigns, the yearbook also features a foreword by Kunal Jeswani – CEO, Ogilvy India – and expert insights from social media biggies like Umang Bedi , Managing Director, Facebook India and South Asia, Taranjeet Singh, Country Director, Twitter India and Rajesh Ghatge, CEO, Indigo Consulting. Grab your copy today for an awe-inspiring read. There is no doubt that digital technology has engulfed our world with a blanket of convenience. There is an app in our phones for literally every day-to-day activity, from booking a cab to ordering pizza. However, the lack of storage space and increased consumption of mobile data and time has led to stagnation in the number of app-users worldwide. To address this issue, websites are now being re-designed with app-like behaviour. Frequent visits to these websites will lead to a pop-up in your phone prompting you to add a direct shortcut to the website in your main menu. The progressive functions of these app-like websites have led to the emergence of Progressive Web Apps (PWAs). This new technology has taken the digital world by storm and is here to stay. Social Beat is one of the few digital marketing agencies who has incorporated this technology in our website. Following is an article from Times of India in which Vikas Chawla, our co-founder, has given us a closer insight into the benefits of Progressive Web Apps and their impact on the consumers. We, at Social Beat, are proud to announce that our co-founder, Vikas Chawla, has been listed as part of the prestigious Pluralsight Digi100 List powered by Paul Writer. The objective of this list is to recognize the top 100 Digital Marketers in India and it’s an honour to be enlisted in it. Last year, Vikas was also awarded As One of The Most Influential Digital Marketing Leaders in India. The list was unveiled during the Futurist Business Conclave on August 18, 2017, at the Leela Ambience, Gurgaon. Apart from revealing the reputed list, the event also featured the master class - The Futurist Marketer - hosted by the CEO of Paul Writer, Jessie Paul. The day-long event was concluded with the revelation of the CX100 and Content 100 lists, along with a keynote delivered by Jaspreet Bindra, Vice President, Digital Transformation, Mahindra and Malcolm Frank, EVP, CSO and CMO at Cognizant and Co-Author of What to Do When Machines Do Everything. For a closer insight into the listing, please visit the Pluralsight Digi100 List Powered by Paul Writer and get inspired! Since our inception in 2012, we have posted more than 200 blog posts around digital marketing, which have received cumulative page views of over a million. In 2017, we have taken one more step towards sharing our knowledge and learnings and launched our first book titled ‘Digital Marketing Insights 2017’. As the name suggests, the book provides its readers with a close understanding of the tips and tricks involved in digital marketing, with deep insights on its diverse platforms. ‘Digital Marketing Insights 2017’ was launched during the second edition of the Facebook Digital Marketing Masterclass conducted in Mumbai. The workshop focused on how to approach digital marketing to build a brand and to acquire quality sales or leads. This insightful session was aptly concluded with the book launch as we presented the first copy to Meera Parthasarathy from Facebook. The book deals with the various aspects of digital marketing and the methods marketers use to leverage the medium to grow their sales and revenue. It also provides readers with a better understanding of the digital marketing trends you must watch out for in 2017 and insights from key areas of digital marketing such as social media, content and SEO, video, digital advertising, mobile app marketing and user experience design. If you are unable to get the right business results via your digital marketing efforts, then this book can provide you insights on how to make the most of Instagram, Facebook, LinkedIn, Snapchat and Pinterest. Insights in the book have been compiled with contributions from digital marketing experts from across India. Kudos to the team at NotionPress (India's largest self publishing company) for editing, designing, publishing and distributing the book in record time. You can buy the e-book through Amazon. You can also find a hard copy at all leading online retail stores such as Amazon, Infibeam and Flipkart. We look forward to receiving your feedback on the book so please do share your comments below! Through the ages, men have always been considered as the breadwinners of the family, while women were reduced to the role of caregiver and homemaker. The generation gap has changed much of this; feminist movements have pushed women to proactively think of better career opportunities and corporations have started become more people focused rather than commodity focused. In today’s world, as women climb up the corporate ladder, the population of women employees usually decrease. At the highest level, world-over, there are only 3% to 4% who are women. In the business world, women currently hold only 4.6 percent of Fortune 500 CEO positions and the same percentage of Fortune 1000 CEO positions. While organisations all over the world talk about promoting women, they are yet to get into the practice of regularly doing that. We find it rather puzzling looking at these statistics since here at Social Beat, the statistics are the opposite. We have an amazing team filled with women leaders who are passionate about their work and are helping Social Beat scale up as one of the leading digital marketing agencies in the country. At Social Beat, 60% of our employee base comprises of women, who come from diverse cultural backgrounds, yet share the same passion for exceptional work ethic in scaling up the company to new heights. We nurture the leadership qualities in women and give them the space to grow. Some grow by helping their peers and creating a support system for the organisation to bank on while the others climb up the ladder, taking our company to tremendous heights which we couldn’t have even dreamt of achieving. Whatever be the case, our female employees have always been the driving force to push our organisation to grow - Grow out of our comfort zones, branch out nationwide, and make a mark in the digital world. There are innumerable ways in which, lady power has helped us on an everyday basis. From working with different teams to managing people from various backgrounds and cultures, the effort put in by our women is not that of playing their designated roles but that of playing a role model for each and everyone of us. A part of our inspiring female workforce comprises of vibrant and youthful freshers who are fueled by their educational qualifications and are brimful with energy to prove their worth in the corporate world. Their dedication towards work is nothing less than an experienced professional and we often find inspiration in their fresh and crisp ideas. The other half of the workforce comprises of skillful experts who radiate enthusiasm through their thoughts and perspectives. Being an ROI driven digital marketing agency, we are all about results and achievements. Talking about inspiring women; three of the most dynamic and versatile women at Social Beat lead the creative, social media and BD teams. Their high-spirited and level-headed nature is the glue which binds their respective teams together. We are proud to mention that 40% of the workforce even at the leadership level comprises of women and we trust their maternal instincts to nurture the company’s everlasting growth. What makes the Women of Social Beat so unique? The problem is, many companies misunderstand the concept of leadership. Becoming a leader acquires more than just skills that define the very role. There is a quality that matters too; a fundamental identity shift that women seem to master better than men. People management skills: People management skills are not something one can earn out of a book, it comes naturally or through life experiences. Women have the natural talent of being people persons; their ability to induce a happy working atmosphere is one to cherish. Great listener: As commanding as leaders should be, they must also have an open door policy; women are known to be great listeners, always keeping the door open to suggestions made by team members. We before me: A good leader knows that the team matters much more than the individual. A woman’s companionship nature makes her dependent yet equally headstrong when it comes to team effort. Multitasking: It may sound cliche but is the cliche that makes the difference between a good leader and a bad one. Undoubtedly, women will always hold the title as the hardest working, fastest and smartest multitaskers. Social Beat’s efforts in making a wonderful working atmosphere have been well received by our numerous female employees. A majority of them have cited four common advantages that make working in the company a pleasurable experience. Freedom of expression: Whether it is spilling your heart out or sharing ingenious ideas, Social Beat is always open to all things new, amazing and sometimes flat-out quirky. A plethora of inter-job opportunities: You may be employed here in a particular post but there is no restriction as to what you want to explore. If you enjoy doing something more, we enjoy helping you do that something, better. Awesome work-life balance: “All work and more play, an employee’s life is hip-hip hooray” as quoted by everyone here! Safe work place: Clean, serene and comforting and uber-friendly, Social Beat makes the safety and security of their employees a very high priority. More women are taking up major roles, which has directly influenced the atmosphere in a workplace. Companies have reported an increased dynamic among their employees with team efforts responsible for improved financial results; women are making a workplace calmer, friendlier and more engaging. Ultimately, having a working atmosphere that is well balanced in gender is important as it helps generate stronger leadership identity development.